Noryangjin, a cluster of private cram institutes for various national exams, is home to some 40,000 Korean test-takers in their 20s and 30s. As most of its students tend to stay near their cram schools from early in the morning to late at night, the area’s dining culture has also evolved along the life patterns of the students. 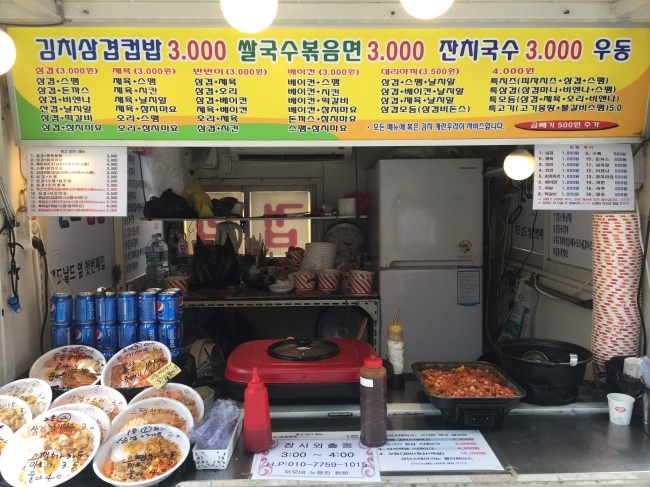 Portions are much cheaper and larger than in other Seoul neighborhoods, while the restaurants, vendors and cafes also tend to serve food quickly to save students’ time. Noryangjin’s distinctive food scene is often portrayed well in Korean dramas and TV shows, such as tvN’s “Drinking Solo” or MBC’s “Romance Full of Life.” In the dramas, the main characters are seen eating breakfast, lunch and dinner in inexpensive eateries such as cup rice food stands or all-you-can-eat restaurants. Here are some test-takers’ soul foods that can be commonly found in the area. Test-takers in Noryangjin would have heard of the so-called “7-11 rule,” which means you can pass any test as long as you study from 7 a.m. to 11 p.m. To stay awake and concentrate for such a long time, caffeine is not an option but a necessity. Starting from the main crossroads, where most of the cram schools are densely concentrated, small cafes are located close to one another along the Manyang street – a coffee place in every 50 steps. Cafes in the area feature low prices, as a cup of Americano coffee costs 1,000 won ($0.90) on average. If paying an additional 500 won, one can get a bigger cup or an extra shot of espresso. When considering that beverages in Korea’s franchise cafes usually cost around 5,000 won, the prices in the area are a real bargain. 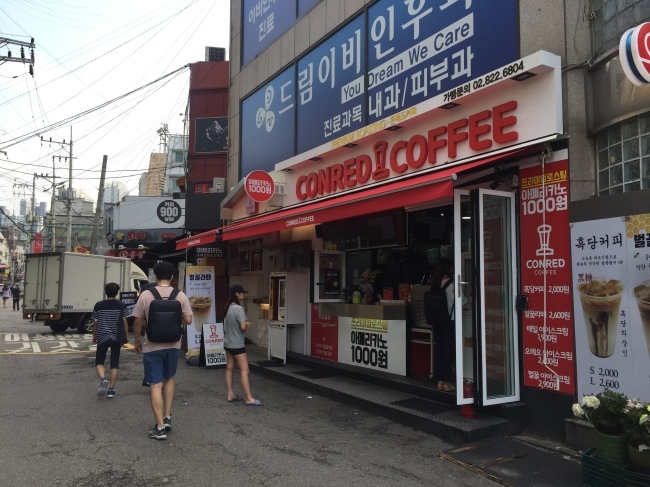 “The coffee price is low, but we sell a lot instead,” said Jeon Gwang-sook, a coffee shop owner in the district. Jeon’s cafe sells about 30 different beverages and all of them cost less than 3,000 won. An Americano is 1,000 won, just like other cafes in the neighborhood. “Our cafe used to have no 1,000 won coffee at the first time when we first opened. The head office, however, specially made 1,000 won coffee for our Noryangjin branch due to the low consumer prices of the district,” Jeon said. According to Jeon, the number of customers peaks in early morning and lunchtime. Also, many students flock to the coffee shops in cram institutes’ break time. To deal with the flood of orders, Jeon has hired extra baristas for the hectic hours. 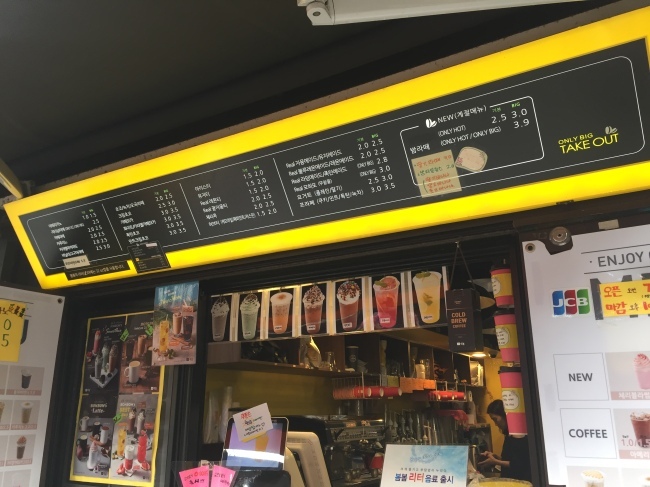 Besides Jeon’s cafe, many of the cafes were seen actively promoting the low price of their beverages via large signboards placed in front of their stores. Some coffee shops have installed kiosks for a coffee order to save labor costs and offer drinks at even lower prices. In the first episode of tvN’s drama “Drinking Solo,” two male students are seen visiting a buffet in Noryangjin. “I’ve never had such a huge meal in my life even on my birthday. Should I stay in Noryangjin one more year to come to this place every day?” one of them says, eating foods he fully loaded on two plates. The restaurant depicted in the episode is one of the many buffet places in the area favored by test takers. 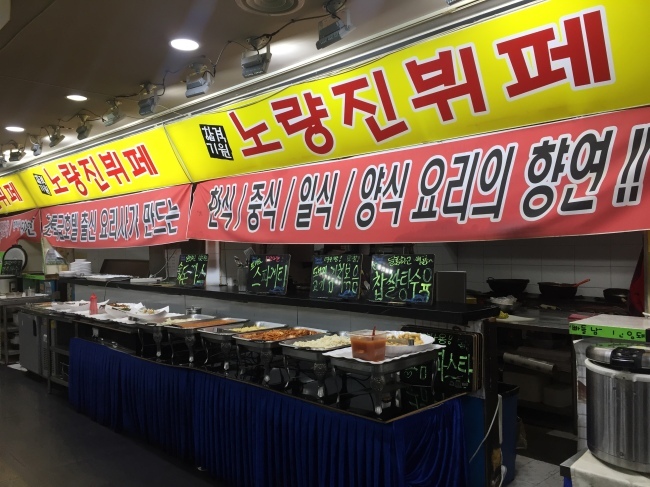 Often called “Goshi Buffet” or “Goshi Restaurant,” after a Korean word for exam, the all-you-can-eat places serve a wide range of food for less than 6,000 won. For regular visitors, the restaurants sell 10 or 50-meal tickets at discounted price. “I frequently eat lunch here as the food reminds me of home-cooked meals,” Park Gwang-il, a 27-year-old test taker who moved to Noryangjin alone from Ulsan a year ago, said in an interview with the Korea Herald. “I can pick whatever I want to eat, and the price is also affordable. If I eat spaghetti in Gangnam, it would cost me 12,000 won per dish,” Park said. The buffet menus vary depending on the restaurants, but most of them offer more than 20 dishes in Korean, Japanese, Chinese and western cuisines. “Our restaurant opens at 10 a.m., but cooks start to prepare the meals from 8 a.m.,” said Lee Eon, who runs a buffet restaurant. 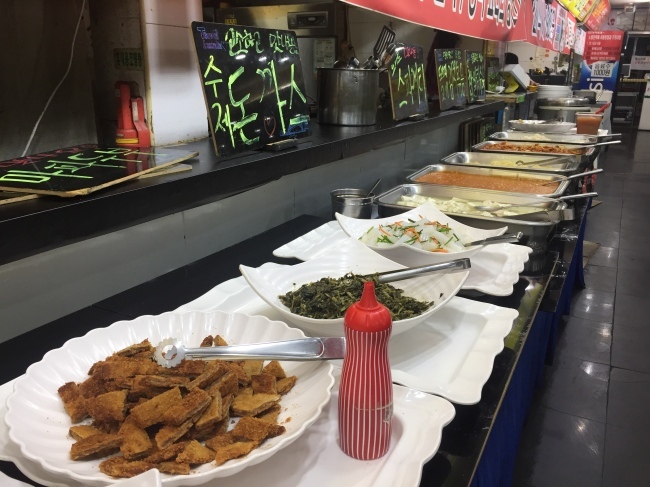 Lee said the margin is small due to the low price, but she can’t stop adding more dishes to her buffet menu when she sees young students enjoying the meal she prepared from the early morning. “About 700 to 800 people come to our store to eat every day, and half of them are regular customers. Of course, I remember each of them. Whenever I encounter their contented faces, I want to cook for them and give them more just like their moms,” Lee said. When heard of the word “Noryangjin,” one of the first things that come to most Koreans’ minds would be a “Cup Rice.” Cup Rice, or “Cupbab” in Korean, refers a bowl of rice covered with various toppings such as spicy meat or vegetables. The dish was said developed in the early 2000s as a quick meal for busy students and soon became Noryangjin’s signature food. 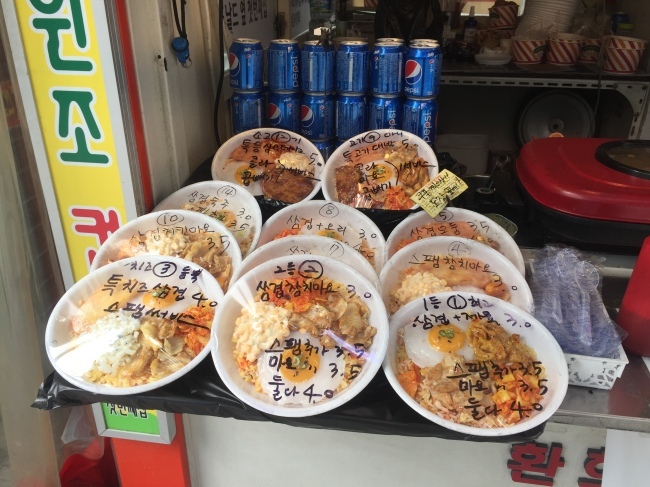 The bowls used to be served from various food stalls located nearby Noryangjin Station, but Seoul City gathered 32 scattered stalls in one alleyway in 2015. Each stall dishes up slightly different styles of cup rice, but the basic ingredients put into the bowl are the same – rice with a fried egg, kimchi and seasoned dried laver. The meat and vegetable toppings vary – there are up to 50 different combinations, but all cups cost 3,000 won to 4,000 won. It only takes a minute to make cup rice, as most of the toppings are cooked ahead of time. “The combination of spicy pork and ham is my favorite one,” Lee Ju-hyun said, a 26-year-old job seeker who lived in the district a year ago. Even though he moved out from the town last year, Lee said he still visits Noryangjin sometimes to eat this cup rice. 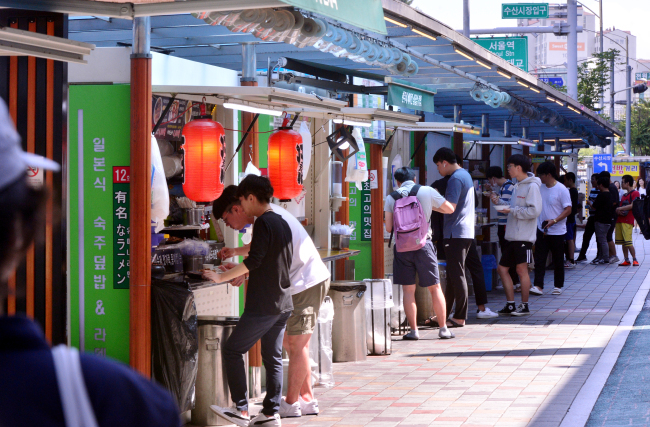 As Noryangjin’s cup rice gained a reputation as the favored street food among its test takers, Cup Rice Alley has now become a popular tourist spot in Seoul. British tourist Rachel Hur, who came to aware of the food via Korean TV show “All the Butlers,” was one of the first-timers trying the cup rice. “I’ve wondered how it’d taste like when I saw it on TV, but it is way more delicious than I expected,” Hur said after finishing her tuna mayonnaise cup rice.